We’re in the middle of summer here, in Boulder, CO. While the days are typically hot, they can also be quite unpredictable. Thanks to the Rocky Mountains, waking up to 50-degree (~10 C) foggy weather is not surprising. In spite of the unpredictable weather, many of us took some vacation this month. Whether it was extending the Fourth of July celebration, spending time with family, or relaxing and enjoying the summer weather, we appreciated our time off, while still managing to accomplish a lot! In this newsletter, Glen Barber enlightens us about the upcoming 12.0 release. I gave a recap of OSCON, that Ed Maste and I attended, and Mark Johnston explains the work on his improved microcode loading project, that we are funding. Finally, Anne Dickison gives us a rundown on upcoming events and information on submitting a talk for MeetBSD. Your support helps us continue this work. Please consider making a donation today. We can’t do it without you. Modern CPUs rely on microcode to control many aspects of their behavior, and microcode updates may be provided by system firmware (BIOS) or the operating system to correct issues in CPU operation discovered while in production, or provide other improvements. FreeBSD has long supported run-time microcode loading, although in a somewhat cumbersome fashion. Currently, a userland tool makes use of a special kernel interface to inject new microcode, which has a couple of downsides. First, microcode is not loaded until well after the kernel has booted, which means that any security or stability improvements provided by a microcode update are not available until late in the boot process. Second, the microcode may revert to that provided by the system after suspend and resume, which is particularly problematic if the new microcode implements new features or control registers (because the registers will “disappear” after resume). To address this, under sponsorship from the FreeBSD Foundation, I am implementing in-kernel microcode loading. Microcode updates will be applied as one of the first stages in the kernel’s boot-up process. In particular, since microcode updates may enable new CPU features it is desirable to ensure that updates are applied before the kernel enumerates these features. As part of this feature, the kernel will automatically re-apply any existing microcode update on each CPU upon resume, so only minimal portions of the kernel may ever execute without an update applied. A patch implementing early loading of Intel microcode updates is currently in review and awaiting feedback. We aim to ensure that the new functionality is available in FreeBSD 12.0, and we plan to backport it to FreeBSD 11-STABLE, ensuring that it will be available in FreeBSD 11.3. Check out the full details. Fundraising for the $1,250,000 needed to support the FreeBSD Project is in full force as we reach the halfway point of 2018. We couldn’t even have begun to reach these goals without the support from the companies who have partnered with us this year. Thank you to NetApp, Microsoft, Tarsnap, VMware, and NeoSmart Technologies for showing your commitment to FreeBSD! Improving quality assurance, continuous integration, and automated testing, with our full-time software engineer. Having multiple software engineers on staff to quickly fix issues and make improvements to FreeBSD. Making improvements to the FreeBSD toolchain, implementing security fixes, and integrating performance, profiling and tracing tools by adding another part-time software engineer. Keeping FreeBSD secure and reliable by having staff members fill key leadership roles on the Security and Release Engineering teams. Sponsoring and attending more open source conferences around the world, to promote FreeBSD and recruit more contributors and users to FreeBSD. Providing more training and educational materials. We can continue the above work, if we meet our goal this year! If your company uses FreeBSD, please consider joining our growing list of 2018 partners. If you haven’t made your donation yet, please consider donating today. We are indebted to the individual donors, and companies listed above who have already shown their commitment to open source. Thank you for supporting FreeBSD and the Foundation! The FreeBSD Release Engineering team sent a reminder email to the FreeBSD developers about the upcoming start to the 12.0-RELEASE cycle. The next major version release cycle is scheduled to begin the code slush on August 11, 2018, which is the point during which the Release Engineering team requests developers avoid adding new features and work on outstanding, known issues. During the start of the 12.0-RELEASE cycle, the head branch will be renamed from “CURRENT” to “ALPHA1”, which is not included in the schedule as the build schedule may be arbitrary and dependent on the state of the tree at the time. Following the “ALPHA1” build, each subsequent build will increment numerically until the stable/12 branch is created and the “BETA” phase of the release cycle begins. 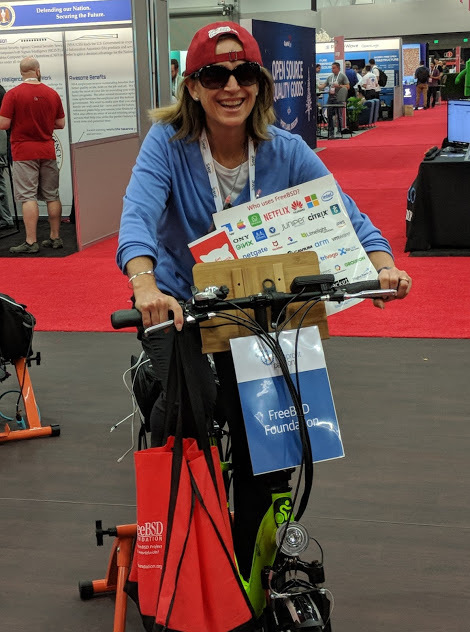 In our continuing effort to promote FreeBSD at open source conferences around the world, Ed Maste and I attended OSCON 2018, July 18-19, in Portland, Oregon. OSCON was held in Austin, Texas the past few years, but moved back to its original home in Portland (O’Reily who runs the conference is based there). The Foundation sponsored a table, as we’ve done for a few years now. Happily, this year we had more space between the tables, which allowed for much more room to hangout and talk. Our main purpose for having a table at OSCON was to raise awareness about FreeBSD and recruit more users and contributors to the Project. We were fortunate to have Rod Grimes, one of the FreeBSD co-founders, help promote FreeBSD with us. Adam Strohl from A-Team Systems, Ben Widawsky from Intel, and Michael Dexter, FreeBSD Documentation Committer, also helped at the table. Adam, being a long time FreeBSD user, had compelling stories on why both people and companies should use FreeBSD. I’ve already recruited him to write a blog post and FreeBSD Journal article for us. We had a lot of visitors at our table. Many of those people stopped by because they were interested in FreeBSD. However, those colorful luggage identifiers at the front of our table also draw in a lot of people who don’t know about FreeBSD. Regardless of why people stopped, we had some great conversations and learned about even more companies who are using FreeBSD. One such company was Oak Ridge National Laboratories, and we had some lengthy discussions with them. Our RPi3 demo drew a lot of attention, and people were pleasantly surprised when they found out that it was running FreeBSD. Michael generously donated his FreeBSD laptop to display during the conference. OSCON and the Open Source Initiative (OSI) both celebrated their 20th anniversaries, and we were thrilled to participate in both. OSI invited us to give a presentation at their OSI Anniversary Celebration. The event was not only a real party, but also a day of presentations about open source. 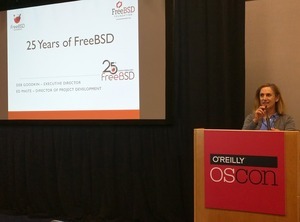 My talk was called 25 Years of FreeBSD. We will post a link to the recording once it’s available. I also included a FreeBSD Timeline beginning with UNIX in the late 1960s. One of the biggest benefits of working with Rod before my talk was hearing about his time during the early days of FreeBSD and how it compared to the early days of Linux. I was able to incorporate some of that information into my presentation. Apparently the presentation went well, because I had a few people come up to me and to tell me how much they enjoyed the talk. A few of them were new to open source. We look forward to continuing the momentum of promoting FreeBSD at other conferences around the world this year. Check out our current list of upcoming events and please feel free to to let us know about an event where we should be promoting FreeBSD. MeetBSD 2018 is a mixed unConference format event featuring both scheduled talks and community-driven events such as birds-of-a-feather meetings and speed geeking sessions. MeetBSD prides itself on hosting a balance of technical and community talks from leaders and luminaries in the BSD community. They are looking for speakers from every corner of the BSD community to submit a topic including things such as: BSD success stories, new developments, and innovative strategies. Submissions are due August 13, 2018. Learn more and submit today. The FreeBSD Foundation is pleased to be an Association Partner of the SNIA Storage Developer Conference (SDC) 2018. SDC takes place September 22-24, 2018, Santa Clara, CA. The agenda includes over 100 presentations on topics including NVMe, Persistent Memory, Solid State, Cloud/Object, Storage Architecture, Performance, SMB, and more. Register before August 24th to get the Early Bird Discount. Available FreeBSD Community Discount: Get $200 off of regular registration. Register here and use code SDC18FreeBSD. In addition, if you register before August 24th, you will receive another $300 off for a savings of $500! The deadline to apply for a EuroBSDcon 2018 Travel Grant Application is August 2. Grants are available to FreeBSD developers and advocates who need assistance with travel expenses for attending conferences related to FreeBSD development. Find out more and apply today! The May/June 2018 issue of the FreeBSD Journal is now available. 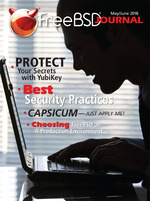 Don’t miss the security focused issue. Journal, now’s your chance. Download the sample issue and be sure to share with your friends and colleagues. ​Tarsnap is an online backup service for BSD, Linux, OS X, and other “unix-like” operating systems. I started work on Tarsnap in 2006 when, as FreeBSD Security Officer, I was worried about the security of the information (such as unreleased security advisories) on my laptop; this resulted in a design for a backup system which inspired the tagline “online backups for the truly paranoid”. Tarsnap would never have existed without FreeBSD for another reason: As the name suggests, the Tarsnap software is based on the standard UNIX tar utility, and to that end I started development using the excellent bsdtar utility which was developed within FreeBSD in the preceding years. If I hadn’t been able to reuse code from a tar utility, it would have taken me years longer to launch Tarsnap; and both the license (BSD) and code quality (excellent) of bsdtar were crucial to my ability to reuse it. As well as reusing code from FreeBSD in the client software, Tarsnap relies entirely on FreeBSD for its server infrastructure. In addition to being easy to maintain and administer, FreeBSD’s separation between the minimalist and internally-maintained “base” system and third-party “ports” code has proven to be extremely useful when responding to security issues: For the recent “shellshock” vulnerabilities, for example, I merely had to confirm that I had never installed bash from the ports tree. If bash had been installed on any of Tarsnap’s servers, it would have required a much more time-consuming process to audit all of the ways that it might have been used — and that process would have been required even if the eventual conclusion was that bash had never been used. Tarsnap Backup Inc. is proud to support FreeBSD, both through my personal work (most recently, maintaining the FreeBSD/EC2 platform) and through its place as a Silver sponsor of the FreeBSD Foundation; and Tarsnap has directly benefited from projects and events which the FreeBSD Foundation has supported. Giving back is not merely an act of charity; it is truly an investment which yields an excellent return.